‘Destructive things’ meaning physical actions and emotional perspectives. Physical actions also include eating unhealthy, staying in unhealthy relationships and repeating self destructive behavior patterns. Emotional perspectives include negative self-image, constant anxiety and negative thinking. 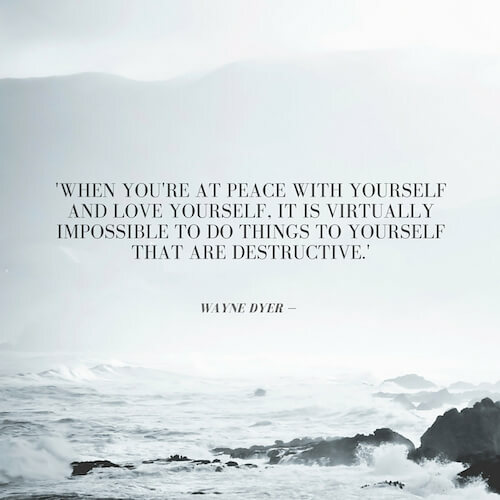 When you are at peace – accept yourself and situation, and love yourself, it transforms the way you think and how you treat yourself. The 5 Skinny Habits includes Quotes from some of the greatest minds of all time about emotional and physical health, mindfulness, and habit formation, while presenting a practical program in order to make permanent changes, at the right pace.